I will first talk about Mantra Sanskar through which the various Doshas get removed. Today I will share knowledge about the 10 Mantra Sanskars. This is the first Mantra Sanskar the most important one out of all. Though this Sanskar is tough to do, it is compulsory and there is no option. A) One must first make a paste of Gorochan, Kumkum, Chandan. Then, he must sit on a Kush Aasan facing the east. After that, make a diagram which I am sharing, using the paste and a wooden stick for writing, which can be taken from a religious articles' store. B)Then do Aavahan of the Isht Dev with his/her Aavahan Shlok. C) Then, do Panchopchar Puja of the Mantra letters including the tones and stresses like " ँ, ्, ः, आ, इ,ं, etc. on the triangle in its respective brackets. 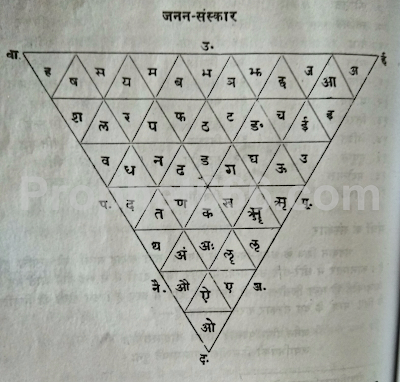 D) Then, write the first syllable of triangle (अ) on a separate Bhojpatra and write the Mantra next to it. There are 49 syllables in the triangle so one must fill 49 Bhojpatra. a) Repeat the steps A, B and C mentioned above. b) Then, write the first Varna of the Mantra on a separate Bhojpatra and recite the Aavahan Shlok of the Mantra's god while touching the syllable simultaneously. The Aavahan Shlok must be recited only once. c) After this, do Panchopchar Puja of the syllable and do 16 mental Jap of the Varna and meditate upon God and imagine as if the Varna has become pure and free from any Dosh. 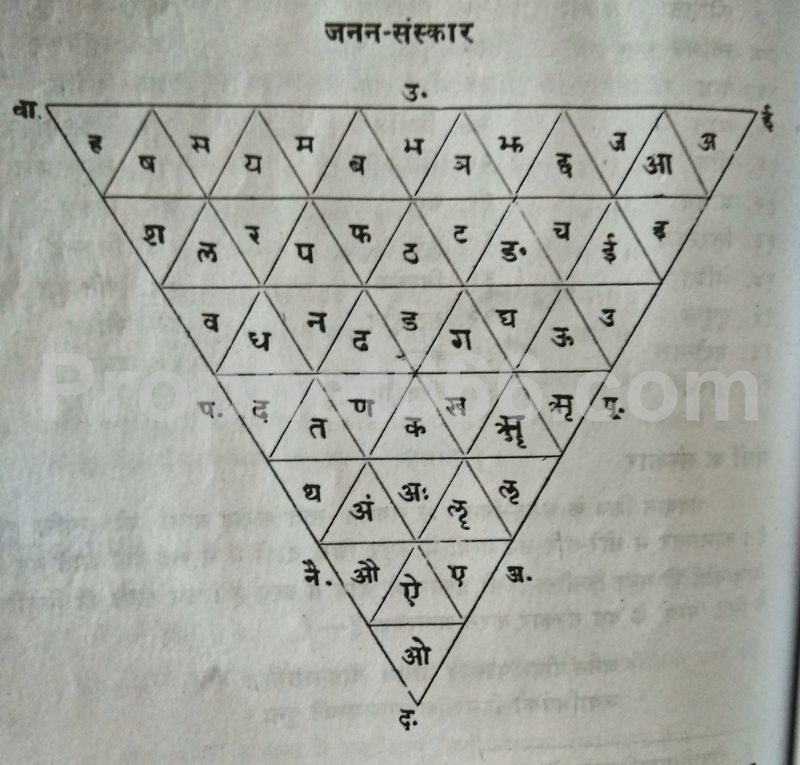 In this procedure, the number of Bhojpatra required depends upon the number of syllables and letters in the Mantra. In this, the Mantra must be chanted for 10 rosaries by doing Sam put of the Hans Mantra. Sit facing the east on a Kush Aasan and Write the Mantra on a Bhojpatra using the paste of Chandan. Then take a copper Lota full of water and dip all the five fingers of the left hand in it. Recite the Mantra ।। ॐ हंसः ॐ ।। 1188 times and imagine as if all the Mantra's power is going in the water. This will energize the water. Then, take a Peepal tree leaf and using the water, do Abhishek of the Mantra written on the Bhojpatra 1000 times. 8] Tarpan Sanskar – make a mixture of pure Ghee, raw cow milk and water and do 100 Tarpan with your Mantra. This is all for Mantra Sanskar. Doing these 10 Sanskars will remove all kinds of dosh in the Mantra for the Sadhak. The remedies is necessary for om om namah shivaya ? Namaste Ashok sir,can you please explain point C ,and what has to be done to bhojpatra after completing the above procedure? You have the make the diagram given above. Then, you need to look at the mantra whose sanskar you are going to do. Thank u so much sir!!!! How we know, which sanskar have to do for specific mantra? Sir do we have to do all steps in one day or can do 1 sanskar in 1 day n then other at other day...? 2 Sir if there is some mistake in doing it will it effect the potency of mantra?